Bout of Books 14 Grand Prize Winner! Bout of Books 14 has ended but the fun doesn't stop until the Grand Prize Winner is announced! Stephanie's winning entry came from visiting Kelly Apple on Facebook. 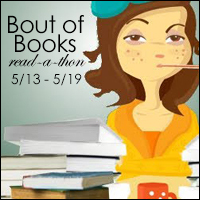 For those that are interested in helping out for the next Bout of Books, we post a call for help roughly a month prior to the start of the read-a-thon - which will be around December 7th for Bout of Books 15. Keep an eye on this blog for that announcement. Once again, thank you to everyone who helped make Bout of Books 14 a success! We appreciate that you love books and how vocal you are about sharing it! You have survived Bout of Books 14! Bout of Books 15 will be from January 4th to January 10th. Sarah Reads Too Much -- What to read next? Welcome to Bout of Books 14! 3. On August 17th, READ!